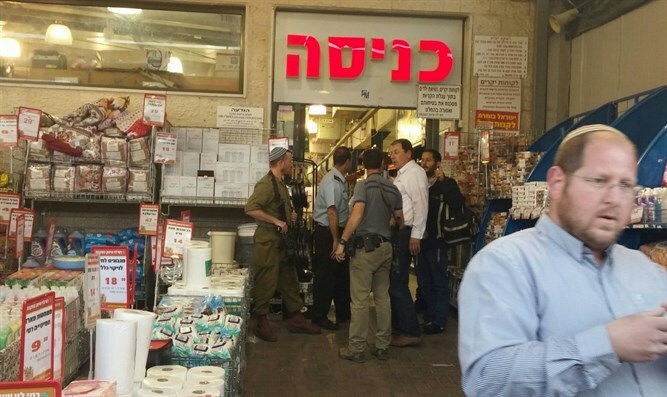 Israel Security Agency announces arrest of terrorist who stabbed man in Sha'ar Binyamin two years ago. Israel Security Agency (Shabak) arrested in the Jerusalem-area Arab town of 'Anata the terrorist who carried out a stabbing attack in December 2015. .
On November 6, 2015, 'Anata resident Bra'a Issi stabbed a Jewish citizen outside the Rami Levy supermarket in the Sha'ar Binyamin industrial zone. The victim, a man in his 40s was seriously wounded in the attack after being stabbed in the upper body, and Issi succeeded in fleeing the scene. Since then, Issi has been on the Israeli security forces' "wanted" list. He was arrested after spending time with Palestinian Authority security agents. Amro Abu Halil, who helped Issi carry out the attack, was arrested in May. He will be tried in a military court for intentionally attempting to cause death.